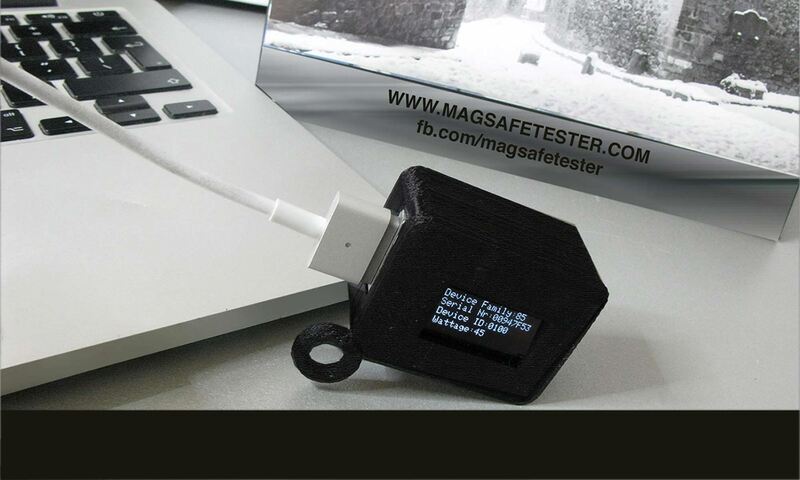 Today we create a new version of our magsafe tester.New version has LCD and you can read magsafe adapterThis is important when you buy chineese cables or adapters.You can read wattage, id and serial number.As i said in my previous post in chineese cables has pic mcu instead of dallas and it is emulated.When you connect magsafe adapter it will read adapter and start blink if adapter is genuine it will blink red green and amber but if not will blink only green and red. Finally found some spare time to find out what is difference between genuine and not genuine adapter cables and why on non genuine adapters you cannot change diodes lights and id is readed with faults. Take logic analyzer and make some captures to see where are differences.This is screenshot of communication between mac and cable. After that sniff communication between arduino and magsafe adapter and find differences.First reset is 480 ms on mac it is 600 ms. It looks that emulation in chineese adapters is not flexible as ds2431 so if we wanna to make tester to read non genuine adapters we must tweak onewire library to read non genuine adapters. After some tweak of times in library finally all is done and you here can download changed arduino library that can be used to read non genuine apple adapters. Replace Onewire.cpp with this one and you will read non genuine cables.